A few minutes ago I published my latest review of some homeschooling literature at the International Center for Home Education Research Reviews Section. I’ve finally gotten the technology right so that readers who are following my facebook page will automatically receive an update whenever I post a new review. This may be the final post I make to this particular blog. If you have somehow stumbled upon this site and would like to read my more recent reviews, this link will take you to the reviews section of ICHER. Thanks to everyone for many wonderful years of blogging and interacting with readers! The International Center for Home Education Research goes live! Just a quick note here to alert readers to the new website for ICHER, the International Center for Home Education Research. It is a brand new organization several homeschool researchers from around the world have been working on for some time now. The website has a lot of very helpful information, including up-to-date summaries of homeschooling regulations in the United States and many other countries and the most comprehensive bibliography of homeschool research available anywhere, all for free. It also has a blog. I’m the moderator of the blog. As you’ll see, the tone on the ICHER blog is a bit less personal than the one I’ve cultivated here. But the content is very similar. In fact I’m beginning the ICHER blog by re-publishing in edited form the most important blog posts on homeschool research I’ve done over the years. I’m starting back in 2008 and working toward the present, so if you’re relatively new to this blog you might enjoy reading the posts on ICHER to see what you missed. If you’ve been with me since 2008 you might enjoy, as I have, revisiting some of these earlier posts to refresh yourself on the content. I plan in the future to continue both this blog and the ICHER blog. On weeks where I do a review of a serious piece of homeschooling research I’ll likely only briefly mention it here and provide a link to the ICHER blog post. But when I want to review less scholarly things like children’s books, movies, memoirs, and the like, I’ll continue to write them up here. I might also on occasion make more personal comments on research here that I wouldn’t make on the more professional blog at ICHER. Anyway, I encourage anyone who’s enjoyed my posts on this blog to check out the resources available on the new ICHER website, to like the organization on Facebook if you feel so inclined, and to follow it on Twitter at ICHER@ICHERtweet. Thanks! A few months ago I reviewed the very important results of the Cardus Education Survey as they related to homeschooling. The findings weren’t pretty. Homeschoolers in the survey didn’t do well academically, failed at marriage, have checked out of politics, and feel that their lives are adrift. In a moment I’m going to post the last of my entries for this calendar year. I’ve got a busy January coming up as well, so it may be February before I’m back. But when I do come back there will eventually be a major post that updates one from a few years ago, giving the complete data available from all of the states about homeschooling enrollment rates. Stay tuned! This post reviews Ruth Morton, “Home Education: Constructions of Choice” in International Electronic Journal of Elementary Education 3, no. 1 (October 2010) Available Here. 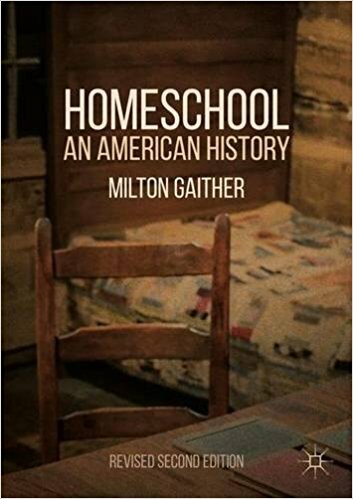 A second, fully revised edition of my 2008 book Homeschool: An American History, was published in March of 2017. Get it here! .